Carrots are probably not the first thing that spring to mind when you think of smoothies, but actually carrots make great smoothies. Add them whole or juice them up then add to your blender. There’s so much to love about a carrot juice smoothie, from their vibrant orange color to their sweet, delicious flavour. They are the perfect morning wake-me-up, filled with vitamins and antioxidants. As carrots are already sweet, they don’t need a lot of extra sweetening and they go well with other fruits. Containing very little to zero calories, negligible amounts of fat and no cholesterol, they are perfect for those watching their weight. 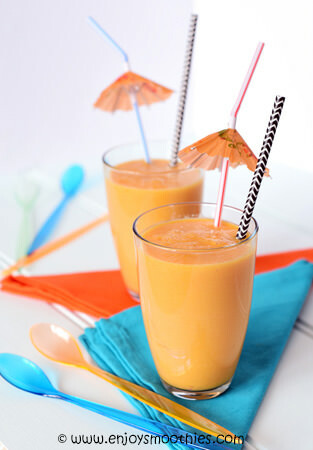 Carrot smoothies can be made using the whole carrot, in which case you get the juice and the pulp, or just the juice. Just remember, if you use carrot juice you will need to use other thickeners. If you aren’t able to juice your own carrots, simply buy ready-made carrot juice. But check the labelling. Make sure you are buying 100% carrot juice that has not been made from concentrate, containing no added preservatives and no added sugar. If you were ever told by your mom as a child to eat your carrots because they were “good for your eyes” then you can thank her because she was right. Carrots contain beta-carotene, which is converted into vitamin A. Vitamin A is essential for good health, but is especially good for your bones, teeth, vision and skin. They also contain vitamins B3, C and E as well as potassium, calcium, iron and zinc. Carotenoids, the antioxidants that give carrots their bright yellow-orange color, may also protect against certain types of cancer, heart disease, and cataracts. When buying choose firm, bright orange carrots without splits or cracks. The deeper the orange color, the more beta-carotene is present. The leafy tops should be bright green. If your carrots do come with their greens (sometimes they don’t) trim them down immediately to one inch, otherwise the carrots will go limp and lose their nutrients more quickly. Carrots without their tops will stay fresh for about two weeks stored in a plastic bag in the refrigerator. But remember don’t discard those green carrot tops, they can be added to green smoothies. Preparation depends on the age of the carrots. Tender young carrots really don’t need peeling, just give them a good wash to get rid of any dirt. The valuable nutrients lie either in or just beneath the skin. Medium-sized carrots may need to be scraped and large carrots will need peeling. Place the mango, grated carrot, apple juice, almond milk and grated ginger into your blender jug and blend until you have a thick smooth consistency. Pour into your favorite smoothie glass and enjoy. Makes 2 glasses. To make your smoothie thicker and creamier, soak the chia seeds first in the almond milk for about half an hour. 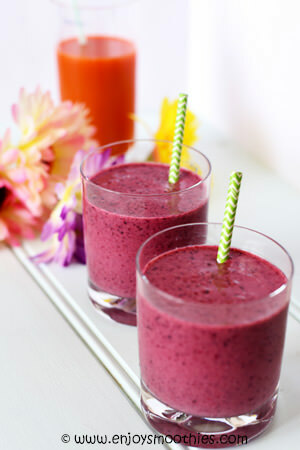 Then add to your blender together with the carrot juice, frozen berries and vanilla yogurt. Blend until your smoothie becomes thick and creamy. 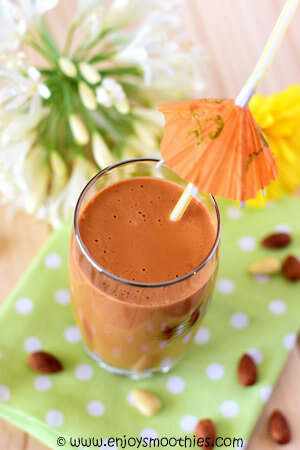 The nuts give this smoothie a wonderfully thick, creamy consistency. Blend together the frozen banana, blanched almonds, raw cashews, carrot juice and vanilla extract until all the nuts are processed and smooth. Your smoothie will become lovely and thick and creamy. This makes one large glass. Cut the peaches in half and remove the stone. There is no need to peel them. 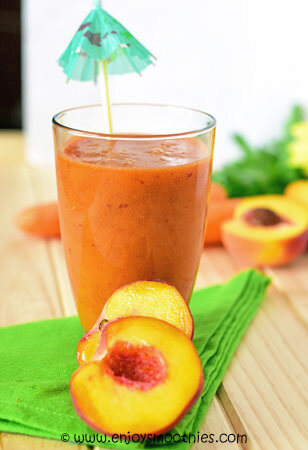 Place the peach halves in your blender, along with the grated carrot, carrot juice, orange juice and grated ginger. Process until a smooth consistency is achieved.